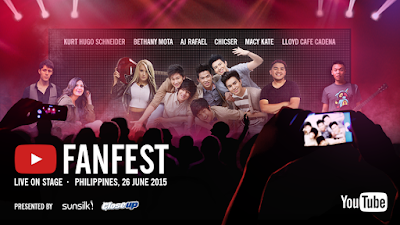 YouTube stars from the Philippines and around the world gather for the first YouTube FanFest live in Manila, Philippines on June 26, 2015 at 7:30pm at Marriott Hotel Grand Ballroom in Pasay City. I had an official invite-only to Youtube Fanfest in Singapore last May 2015 but wasn't able to go. Hope I get to attend this time in Manila. Get ready to be thrilled by a sensational mix of music, comedy and beauty! To score complimentary passes (in the form of wristbands), some of the Youtube creators are giving away passes. Just visit Youtube Fanfest Facebook Page for more details.